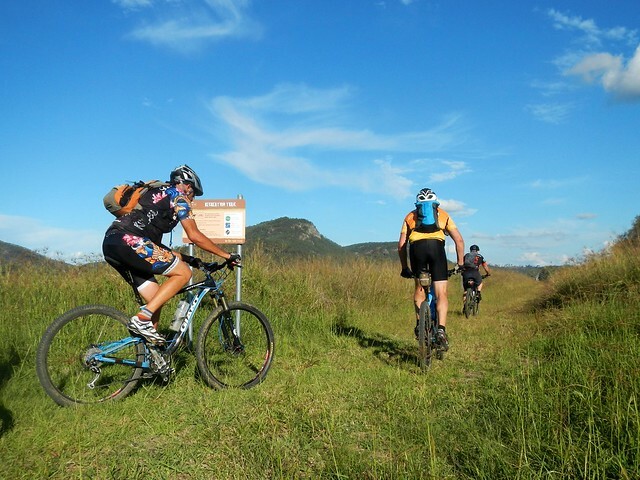 It’s supposed to be all down-hill if you start a ride from its highest point. 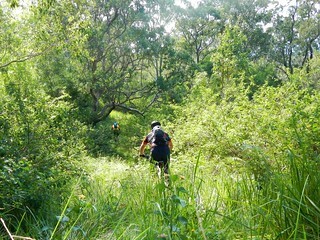 But contrary to what I told everyone before today’s epic, this ended up being one of the more difficult treks we’ve done. 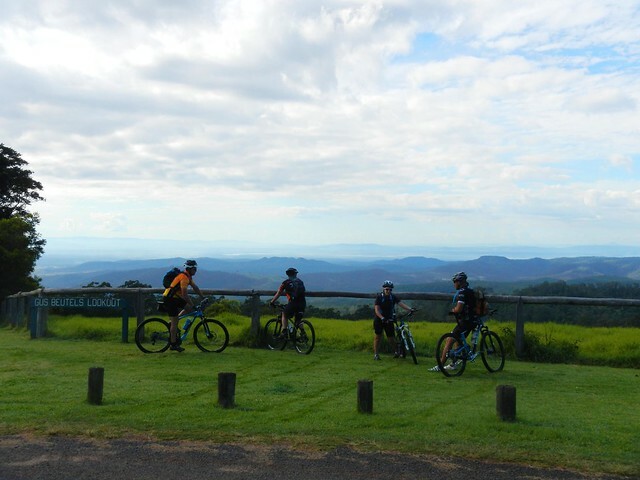 This was a point-to-point ride starting at the panoramic Gus Beutel’s Lookout, almost 760 metres above sea leval, near Ravensbourne on the Great Dividing Range. 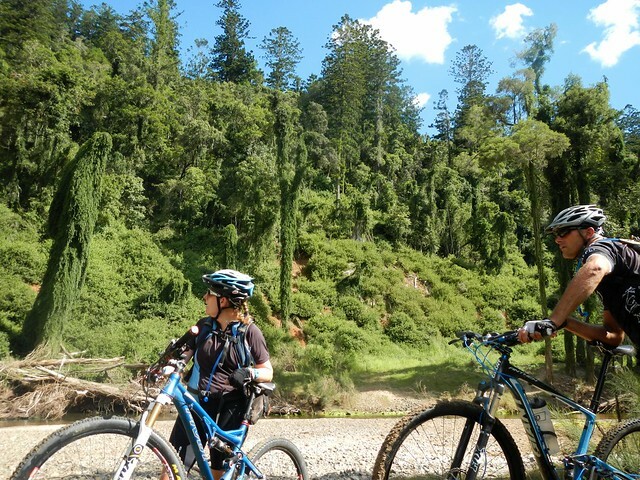 We intended to ride down the hill to Esk via some of the tracks that pass through Deongwar State Forest. It’s logistically a bit more complicated when you starting and finishing a ride at different points. It means you need more cars. We met at Esk, parked some of the cars there, and bundled everyone and their gear into two of the vehicles which took us up the hill to the lookout. The lookout is named after a German pioneer, Gustav Beutel, who settled in the area after emmigrating from Brandenburg in the nineteenth century. In 1924 he was granted a special lease to clear a one hectare section for a picnic ground and lookout for the many visitors who came to the Ravensbourne district to enjoy the rainforests and amazing views. 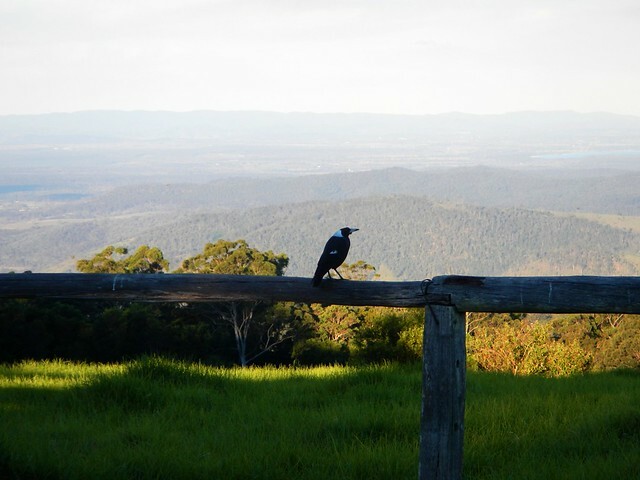 From the lookout we followed some quiet dirt roads around the back of Ravensbourne on our way to the State Forest. This whole area was covered in thick rainforest prior to European settlement. It was the traditional home of the Jarowair and Jagera people, but contained important pathways for other indigenous groups travelling northwards for ceremonial gatherings in the Bunya mountains. In the late nineteenth century, most of the forest was cleared for its valuable Cedar, Blackbean and Rosewood timber, and to provide land for potatoes, maize and dairy. Since the 1920’s successive governments have tried to redress the damage caused by land-clearing, and today about 700 hectares of forest is protected in Ravensbourne National Park, with almost 5,000 hecatres set aside in Deongwar State forest. Before entering Deongwar, we had to deal with a major obstruction. On the GPS we were supposed to be on a road, but (as often happens) the reality was that we had to pass through a dense thicket of Lantana. This prickly scourge sprouts thick branches which are difficult to push through, and rip your skin and clothes as you push through. The discomfort was worth it. 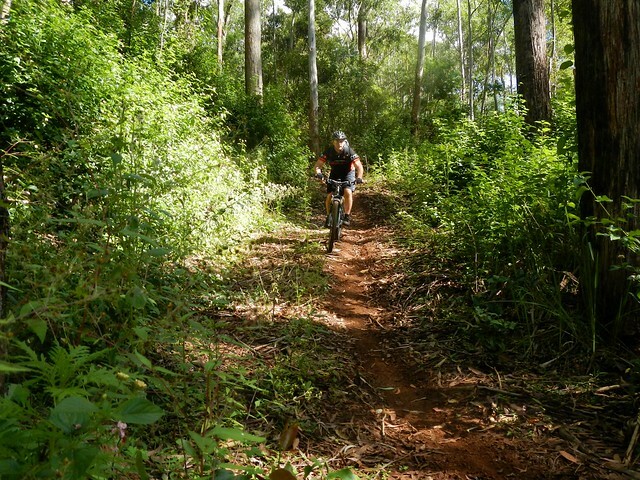 Not long after we were hurtling down some wonderful twisty single-tracks as we descended through Deongwar forest. The tracks conttinued for ages, mostly downhill with one or two sharp pinch-climbs to contend with, and a few water-bars to jump over. It was a lot of fun. Eventually we found our way to Brennan Road. Its gentle downhill slope let us zip through the trees towards the more challenging ridgelines that dropped towards Cressbrook dam. 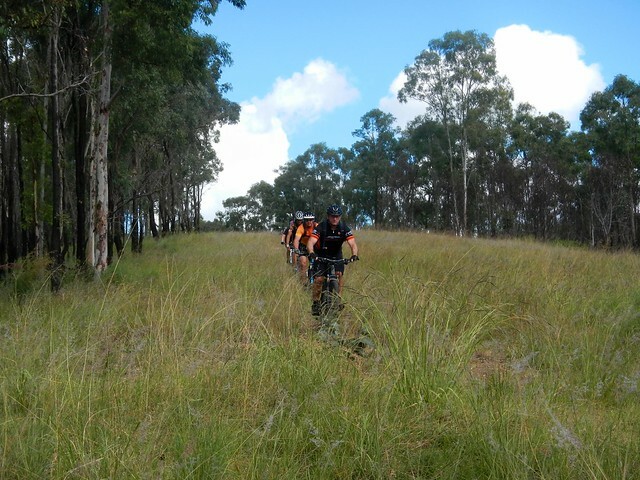 We chose a ridgeline which dropped us about 200 metres in the space of 2 kilometres. In places the downward gradient was over 20%. 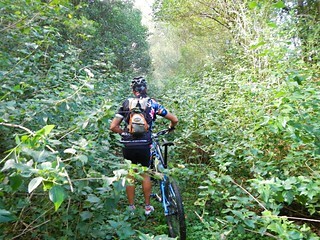 The track was covered in thick grass in many places, but it was surprisingly smooth to ride. Thankfully there were no hidden rocks or pot-holes! 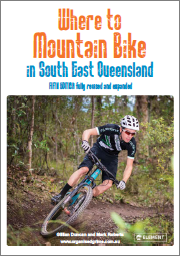 The aerial maps of this area show a track called “Sugarloaf Road”. From the air it looked like a nice track. Once got there, however, I quickly realized I was actually looking at a rock-strewn dry creek bed. 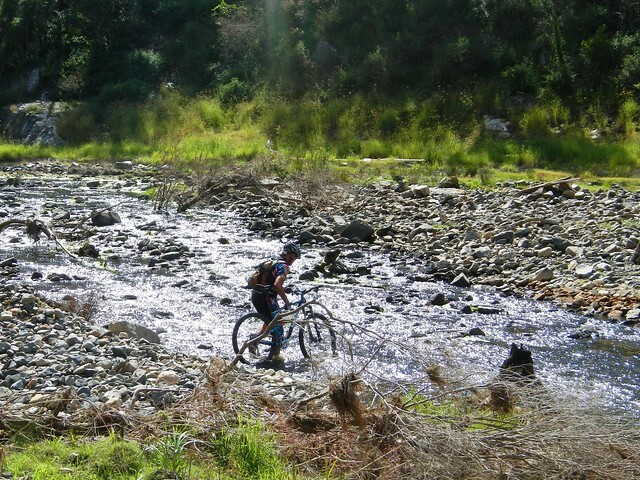 It was almost impossible to ride over this natural rock garden, so we decided to push the bikes until we reached smoother terrain. 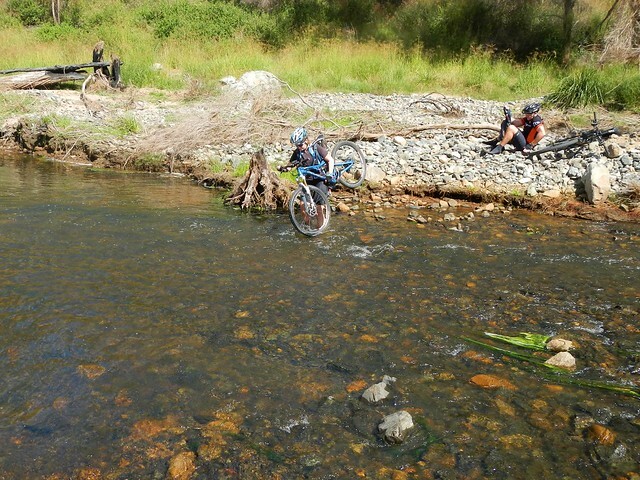 We had to cross Cressbrook Creek quite a few times. I hate getting my feet wet, but today the water felt great! This was the slowest part of the trip. A lot of the track was un-rideable. I lost count of the number of times we had to cross the creek. Eventually we took a bit of a break and enjoyed our lunch on the banks of Cressbrook Creek. Although it was slow-going along the creek, the views were stunning. This steep slope was covered in forests of Hoop Pines strewn with vines. This was no tame plantation but a wild scrub that had obviously been too steep to harvest in logging days. 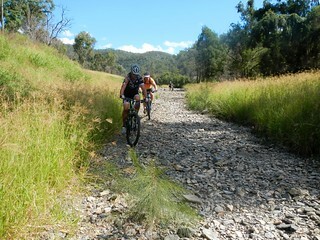 And after a couple of hours of slogging along a barely visible creekside track, we reached a lovely gravel road. 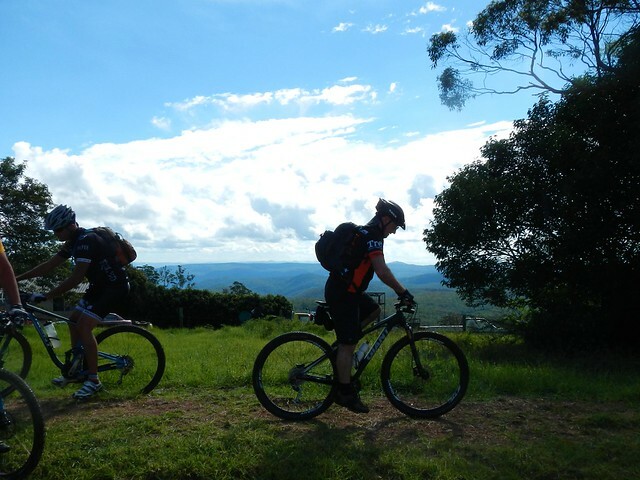 It might have been hilly, but it was a joy to ride on compared to the rough terrain we’d had to cover so far. Our speed greatly improved as we progressed along the road. 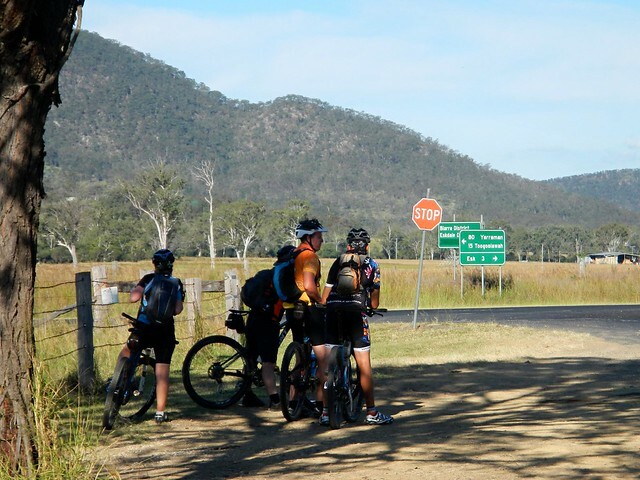 Eventually we joined Kipper Creek Road which is part of the Bicentennial National Trail – a 5,300km track stretching from Cooktown in North Queensland to Healesville in Victoria. For today, unfortunately, we only travelled on it a short way. 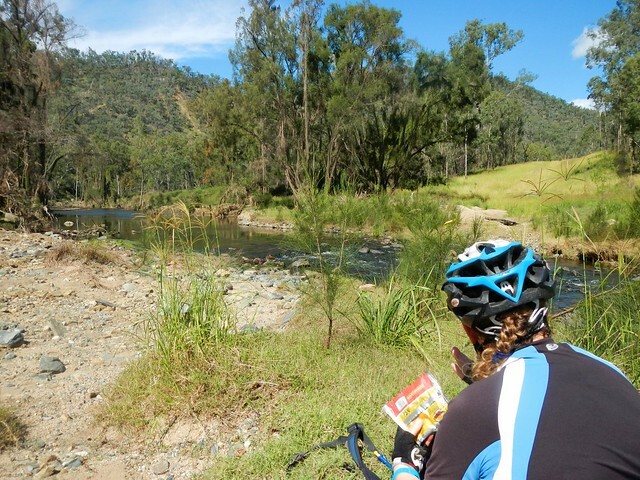 From there we made our way along the paved road towards Esk on the Brisbane Valley Highway. 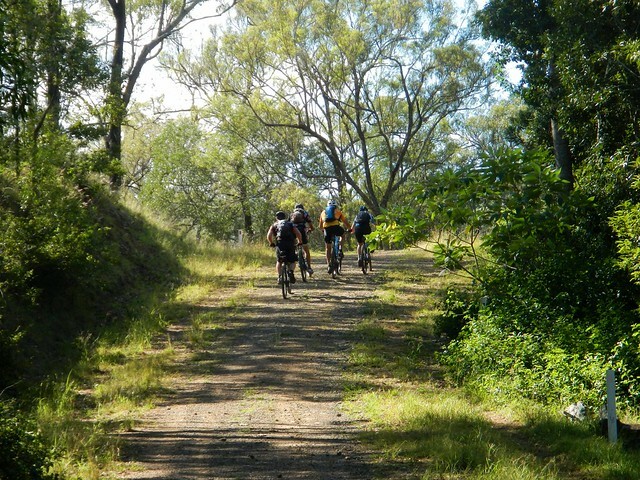 The last leg of our trip was along the Brisbane Valley Rail Trail. 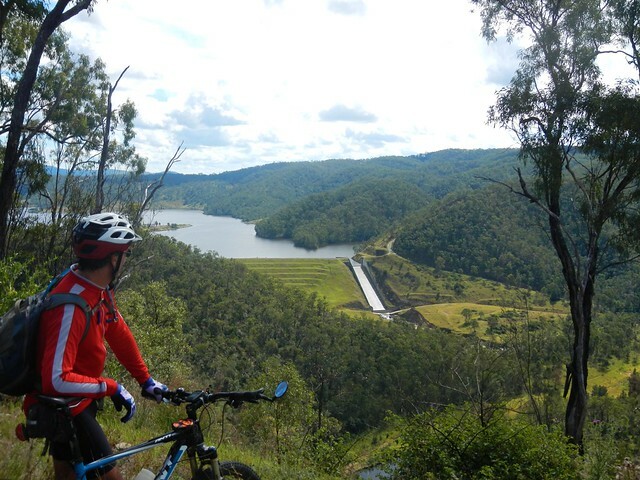 This recreational track follows the course of a disused railway line, and is a much more enjoyable way to get into town on a bike than trying to battle cars on the highway. We eventually made it back to Esk and enjoyed a well-earned drink and snack at the local bakery before driving back up the hill to retrieve the other vehicles. Sunset at Gus Beutel’s Lookout is spectacular. 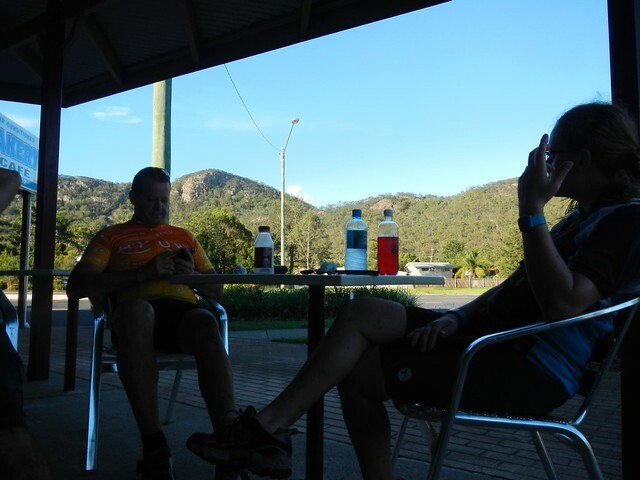 We rode a total of about 65km in six and a half hours. Our track descended about 1,730 metres, but we had to climb over 1,100 metres in the process – so this was no easy downhill roll. I burned just under 3,000 kcal. 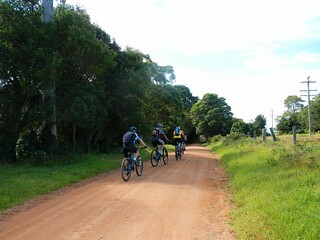 This is a tough ride through some really rough country. It deserves a rating of 9 out of 10 on the tough-o-meter. Don’t do this ride alone. 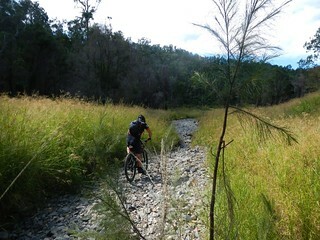 Cressbrook Creek would be dangerous and impassable after rain, so the ride is best done in the cooler drier months. Great photos and beautiful countryside Neil. Looked like a tough but good day out! “Tough but good” is a perfect way to sum it up. 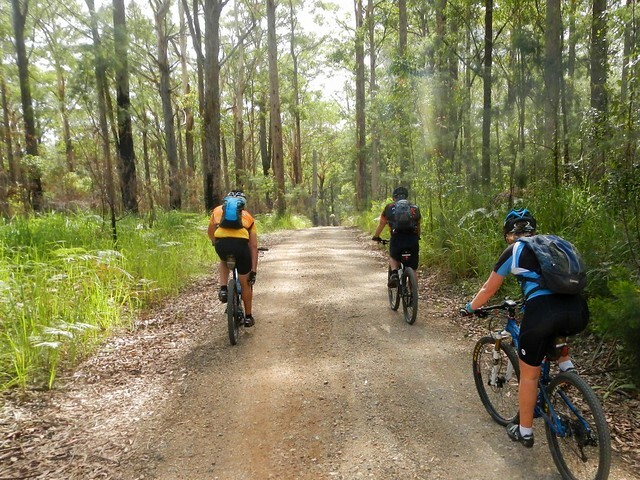 I think we’ll be back there again this year and try our luck on Seventeen Mile Rd as a route to Lockyer National Park. That’ll probably be another point-to-point but I’d really like a driver next time to save time at the start and end of the day. Didn’t get home till 7pm after leaving at 6.30am. G’day Geoff. 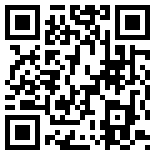 Thanks for having a read. You’d be most welcome. 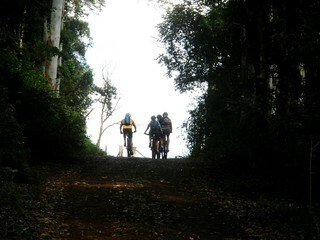 I usually post details of social rides on the forums at http://MTBDirt.com.au. 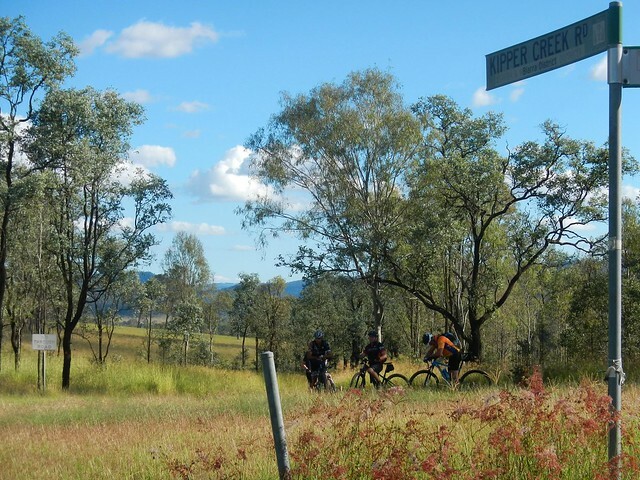 If you subscribe to the “Queensland – Organize a Ride” thread you’ll get a heads up of when we’re doing another one. 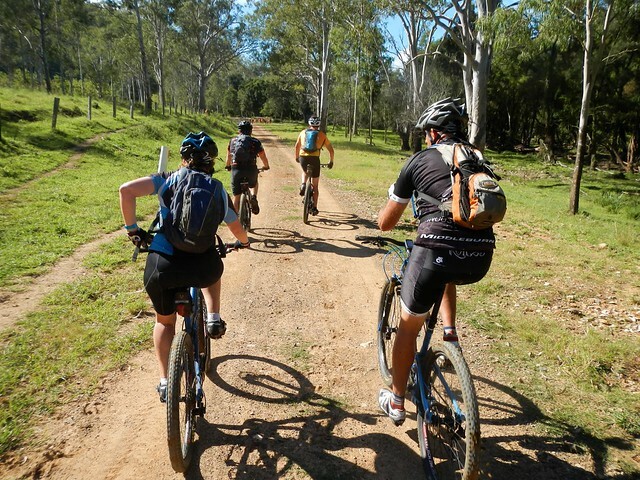 My friends and I are working on two rides in your area that might interest you – Jimna – Monsildale (loop) and Ravensbourne – Gatton via Lockyer National Park.